In Japan: 'No Major Progress' Draining Radioactive Water From Plant : The Two-Way Also, a low level of plutonium has been detected in soil samples from near the crippled facility. That adds to evidence that some fuel rods may have begun to melt. 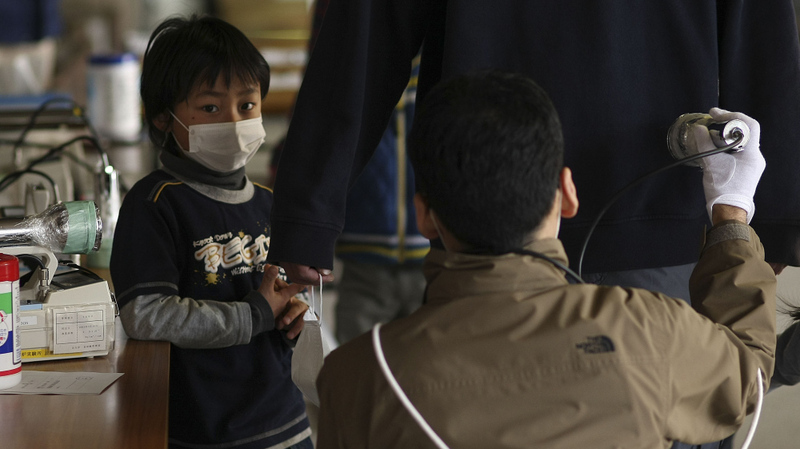 Earlier today (March 29, 2011), a boy watched his father being screened for radiation at a shelter in Fukushima prefecture. -- "No major progress is reported in the effort to drain radioactive water filling the basements of turbine buildings near 3 reactors in the damaged Fukushima nuclear facility," Japan's NHK reports. "The delay is hampering work to cool down and stabilize the Dai-Ichi nuclear power plant." Also from NHK: "Tokyo Electric Power Company says plutonium has been found in soil samples from the Fukushima Daiichi nuclear power plant. It says the radioactive substance appears to be related to the ongoing nuclear accident, but the level detected is the same as that found in other parts of Japan and does not pose a threat to human health." "The presence of plutonium at the plant adds to the evidence that overheated fuel rods began to melt," NPR's Jon Hamilton reports from Tokyo. -- "Japan's leader insisted Tuesday that the country was on 'maximum alert' to bring its nuclear crisis under control, but the spread of radiation raised concerns about the ability of experts to stabilize the crippled reactor complex," The Associated Press writes. "Wan but resolute, Prime Minister Naoto Kan told parliament that Japan was grappling with its worst problems since World War II." -- "More than 28,000 people were killed or remain unaccounted for in the quake and tsunami," according to Japan's National Police Agency, Kyodo News reports. -- "Tohoku Disaster May Bring Automakers To Their Knees," says the top headline at the website of The Japan Times.